Every now and then, along comes a well-born and usually quite beautiful gal who at a young and dewy age comes to epitomize the uber-chic intersection between New York City's nitty gritty downtown art world and uptown high society denizens. In the mid- to late-1960s that female flower of downtown freaky meets uptown money was Jane Holzer (nee Brukenfeld). Missus Holzer was the pampered daughter of a successful Palm Beach, FL real estate developer, the seriously stylish young wife of Leonard Holzer–an heir to a New York real estate fortune–and a budding but reluctant Park Avenue princess with a heaping halo of blond hair. The fate of the young, glammy and well-connected Missus Holzer was sealed in 1963 when she was introduced to up and coming art world weirdo Andy Warhol by British bon vivant, global socialite, cuzzin of the late Princess Diana, prolific writer and nice, gay decorator Nicky Haslam. Soon after meeting, Mister Warhol–who had yet to metamorphosize from an arty-farty toad about town into the international pop art icon he would become–asked Missus Holzer to appear in Soap Opera, one of his first of many films. Missus Holzer–who was subsequently nicknamed "Baby Jane" by high society gossip columnist Carol Bjorkman–went on to appear in several of Mister Warhol's movies. Although Missus Holzer, who palled around with people like Mick Jagger, Sharon Tate and Janis Joplin, had bailed out of the drug-infested scene at Mister Warhol's famed Factory by 1967 or eight she managed to maintain a lasting friendship with the wacky and be-wigged artist. From early on Baby Jane Holzer had a penchant for posh properties. Real estate was, after all, in her blood. In 1970, not long before her marriage to Mister Holzer made its final flush down the terlit of love, the on the rocks couple purchased a legendary and leviathan Southampton, NY estate called Chestertown House. The white brick Colonial Revival mansion, situated on 16 ocean front acres, was originally built by Henry Francis du Pont and contained an unimginable 60 bedrooms. That's not a typo puppies, Chestertown House measured more than 45,000 square feet and contained more than 70 rooms, 60 of them being bedrooms. The Holzers, who stripped the house of many of its historic insterior features, quickly defaulted on the mortgage and the estate was sold at auction to coal magnate John Samuels III. By 1979 Chestertown House was in a state of disrepair and had come to be owned by tax evader Barry Trupin who finished tearing out the original interiors and transformed the house into an infamous and over-sized neo-Gothic horror show of turrets, cathedral windows and shark tanks that he called Dragon's Head. Mister Trupin went belly-up bankrupt before he finished punishing the old du Pont property with his tacky vision and sold it in 1992 or three for about $2,300,000 to WorldCom executive Francesco Galesi who re-named the grotesquerie Elysium. Some of the children who retain a few brain cells may recall that Mister Galesi–no stranger to trophy real estate–hoisted his massive, Robert Couturier designed doo-plex at the super posh River House building in New York City on the market in 2005 with and asking price of $50,000,000. He still had the 16 room and 8 pooper apartment on the market as recently as the fall of 2009 with an asking price that had dipped dramatically to $35,000,000. Mister Galesi sold Elysium in 2003 for approximately $29,900,000 to clothing king–or queen, depending on who you ask–Calvin Klein who razed the behemoth beast to make way for a smaller but still massive and minimal Michael Haverland designed mansion that is, as far as we know, not yet completed. But we digress...After Mister and Missus Holzer went splitsville and Missus Jane Holzer became Miz Jane Holzer, she moved out of her sprawling Park Avenue pad where she reportedly employed a couple of drag queens as butlers, scrapped city life and decamped with her young and only son to a 170+ acre farm in the Pennsylvania Amish country. Soon enough the thrill farm life faded and in the mid-1980s she opened–and closed–a couple of ice cream parlors she called Sweet Baby Jane's in Palm Beach and Los Angeles. Eventually, the now in her late 60s Miz Holzer picked up the family mantle and started buying, renovating and selling high priced properties, mainly on the Upper East Side of Manhattan. Records show that between 2005 and 2009 Miz Holzer sold at least three apartments at The Volney on East 74th Street including a 5 bedroom and 6.5 pooper doo-plex penthouse that she unloaded in April of 2009 for $14,100,000 (above). The buyer was–for those children who might care to know–apparel mogul Jason Rabin who among other things holds the licensing and brand management agreements for big boo-tay Beyoncé's House of Dereon fashion dee-zaster. Property records show that Mister Rabin and the the Missus, who previously bunked at 850 Park Avenue, also own a major house in the Hamptons on Water Mill's hoity toity Cobb Road. There we go a-digressin' yet again. Miz Holzer, who operates out of a Lower East Side building just around the corner from where Your Mama lived for about a hundred years before marrying up and moving to the Dr. Cooter's much swankier digs on the far west side of Chelsea, currently has an East 69th Street townhouse (above) on the market with an asking price of $15,900,000. This is the property, believe it or not, Your Mama originally planned to discuss when we sat down in front of our trusty laptop yesterday morning. Records reveal that in February of 2008 Miz Holzer paid $10,500,000 for the 20-foot wide brick and limestone Federal style townhouse that measures, according to listing information, approximately 8,350 square feet. From what we can tell by peeping and poking around the Street Easy, Miz Holzer dumped the 5-floor (plus basement) townhouse back on the market about 18 months later with an asking price of $17,000,000. By mid-January of 2010 Miz Holzer had karate chopped the asking price to its current number of $15,900,000. A quick compare and contrast of current listing photos and the listing photos from the time Miz Holzer purchased the property reveals that little obvious was altered besides replacing the old and outdated kitchen with a sleek, all white galley style number that closely resembles the one she installed in the penthouse property on East 74th Street that she sold to Mister Rabin. Not even the very 1980s master pooper was replaced but given that current listing information promotes the townhouse as "newly renovated and completely restored" we have to make the not entirely safe assumption that Miz Holzer updated and upgraded some of the internal systems of the house. According to listing information, the townhouse contains 5 bedrooms and 5 full and 1 half poopers. 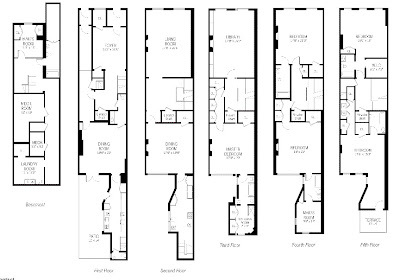 A study of the floor plan included with marketing materials (above), however, shows 5 family bedrooms, each with a private pooper, plus 2 powder poopers, one right off the foyer and another at the back of the ground floor kitchen. 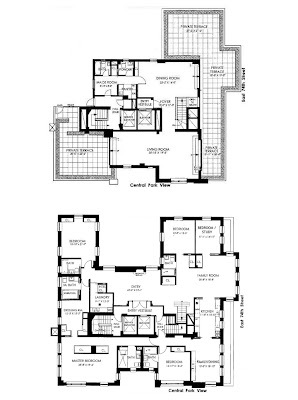 The floor plan also indicates there are 2 staff rooms, one in the basement with its own private pooper and a second one rather bizarrely and impractically accessible only through the pooper of one of the 4th floor guest bedrooms. The grand foyer, the dining room and the formal living–where Miz Holzer's hung an humongous and delightfully incongruous purple Anselm Reyle painting–all retain much of the townhouse's original and ornate architectural detailing. The public rooms also include a third floor library with dee-lishus Chinese red lacquer walls and a gold-leafed ceiling. There are additionally 2 full kitchens connected by a back staircase, 7 working fireplaces, a terrace off the back of the 5th floor, a petite backyard, and laundry facilities in the basement. The elevator does not currently appear to descend down into the basement, a matter that would cause our tyrannical house gurl Svetlana to have herself a hissy fit of epic proportions. Iffin Your Mama and the Dr. Cooter were to buy this house–which we most assuredly could never afford–we are certain Svetlana would insist we hire her an assistant whose sole duty was to carry and ferry the laundry from the elevator on the ground floor to the basement laundry room and back because ol' Sveta does not do any heavy lifting or, for that matter, any lifting she deems heavy. At some point in the not too distant past, the well preserved Miz Holzer, who still has that huge halo of blond hair, toured the peeps at LXTV through the townhouse during which she explains how the properties she buys speak to her and how she digs the tension and juxtaposition created between the elaborate, old-school details of this townhouse and the much more modern furniture and artwork she's used to stage the house. That's right butter beans, stage the house. Despite the notable artworks peppered throughout the house and despite the very contemporary furnishings, this is not where Baby Jane Holzer actually lives. Miz Holzer, by all accounts, lives in a far more grand, 6 floor and 15,000 square foot townhouse on East 65th Street that property records and previous reports reveal she acquired in 2006 for $15,772,324. In the spring of 2008, Miz Holzer had the lucky and soo-blime writer Pilar Viladas over to her elegant, quirky and art-filled townhouse for a tour that developed into a feature article in The New York Times Style Magazine. The long article not only gives a good feel for who Miz Holzer is and how she operates but also highlights her impressive, valuable and vast contemporary art collection that includes signature works by top flight art stars such as Ed Ruscha, Keith Haring, Andy Warhol, Richard Prince, Jonathan Seliger, Tom Sachs, Christopher Wool, Rudolf Stingel and any number of lesser known artists. In November of 2008, before he went on to greener and arguably more dignified journalistic pastures, Mister Max Abelson at the New York Observer revealed that he had unexpectedly come across an online listing for Miz Holzer's East 65th Street townhouse that showed a spine tingling asking price of $45,000,000. However, a little intrepid questioning of Joanna Cutler, the real estate agent on whose website the listing appeared, revealed that Miz Holzer did not actually authorize Miz Cutler to put the property on her website and hence the listing was quickly removed. Although Your Mama is of the mindset that most wealthy people including Miz Holzer will sell their homes for the right price, we really don't not know if Miz Holzer's townhouse is or is not quietly available. We do know, however, that Miz Cutler is a real estate broker Miz Holzer has used for transactions in the past and she is one of the two agents who currently represent the East 69th Street townhouse that is on the market. Property records also show that among a myriad of other properties Miz Holzer also owns a small and secluded house in Cos Cob, CT as well as a not particularly small residence just five houses from the ocean in posh Palm Beach, FL that she's owned since at least 1997. Just great!.........The History Channel has nothing on our Mama! Mama, even if I don't know or care about the individual owning the property, your summations are always worth the read! Not sure wht post it was, but I recall reading a commenter asking what ever happened to Kurt Rappaports house on Cresent.... he SOLD it for $24 million in January. Well preserved thanks to the diligent ministrations of the inimitable Dr. Pat Wexler, the go to gal in New York for luxe Botox and an array of fillers. Her blonde mane used to be and, unless they've had a falling out, still is courtesy of the equally well preserved Brad Johns. Unless she sold, Jane Holzer also owns a house on the ocean in Southampton that was published in Elle Decor or AD several years ago. I think I remember it being insinuated that she was having some cash flow issues. Tons of very valuable art and who knows what else, but not the best time to be selling art. Unlike some Hollywood types, it would absolutely destroy her to sell anything at a loss or merely break even! @Candi Spelling: It's not a skull painting, it's a photo of the $100 million dollar platinum-and-diamond skull sculpture Damian Hirst created in 2007. Personally, I like the juxtaposition of the Warhol wallpaper cow and the Holstein-themed furniture in the townhouse, but I've a feeling it would get old rather quickly (the rug not the lipstick-pink cow). I'm with Baby Jane: I like the frisson of old and new when it's well done, like this. Anon 3:12; Is that Dr. Pat Wexler the same one who pimped out her wares on Housewives of New York? If so, it's a good thing for our profession that she is "inimitable" and I hope she stays that way. I worked for Hurricane Holzer briefly. my left eye still twitches if I think about it. I'm gonna go see if I have any xanax. Hurricane Holzer. I like that. Yeah, the lady I know that knows Hurricane going way back to the time when they were two couples with young children summering in East Hampton, is a crazy, spoiled rich person too. Apparently "summering" in EH was quite exciting in those days. Lots of experimentation. Experimentation.......drugs, crazy rich people.....didn'tsco they used to call East Hampton Shutter Island? You have to check things out! Chestertown House had 9 bedrooms and 15 little servants bedrooms. NOT anything near 60 bedrooms!!! It's in the Houses of the Hamptons book, which came out a couple of years ago. Even the floorplans. Easy for you to check! Why are you picking on my cousin, Jane Brukenfeld Holzer? She has accomplished a great deal in her life after being the famous Baby Jane Brukenfeld Holzer and deserves better treatment.